1970 - 1972 Camaro Manual Shift Tunnel 4 Speed Bezel New Best on Market! 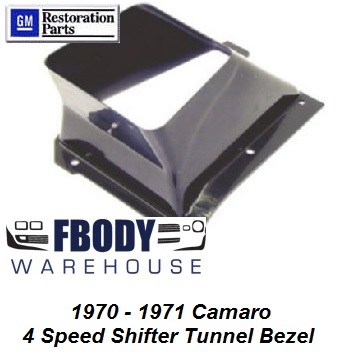 This is a shifter tunnel for 1970 1971 1972 Camaro with factory 3 and 4 speed manual transmissions. this unit mounts into the center console and is the highest quality reproduction on the market today. Don't buy cheap China junk, buy the proper fit and quality the first time! The BEST reproduction with original appearance.